I have a townhouse with walls so thin that I can hear my neighbors watching TV or cough. So I decided to knock down the party wall between my dining room and their living room where I can decouple the walls with Whisperclip/hat channel and Greenglue+ (2) 5/8" drywall . Once I did that I noticed that there is a piece of plywood behind the insulation dividing both our sides as you can see in the pictures. It looks like that I have two air pockets with insulation inside. One on my side of the plywood and one on my neighbor's side of the plywood. Do I have a triple leaf effect that I need to correct first and if so how? Re: Triple Leaf party wall? Well, the OSB layer is going to have to stay - that's an integral part of the structure and you violate firecode by removing or penetrating it. Even if you had a triple leaf system with the existing drywall, the wall should have been much quieter than you describe. I would recommend removing all the insulation and checking for any unsealed penetrations/gaps leaking noise, then seal them up. If it's in your budget, you could adhere layer(s) of drywall to the OSB layer with Green Glue and that will dampen a lot of the vibration. 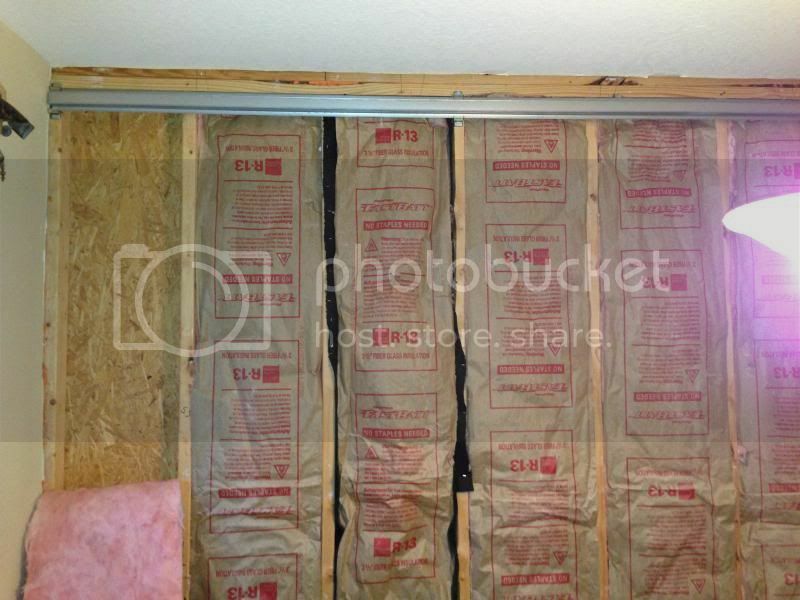 Then you can reinstall the insulation and use your hat channels and clips to put up the final layers of drywall. Not sure what type of system you'd end up with, maybe a 'damped-triple-leaf', but it should kill the neighbor noise quite well. Agreed. You must leave the ply/osb where it is. Triple leaf effect is due to coincident resonances. Ie; partitions of the same mass and structure where their fundamental frequency is the same. 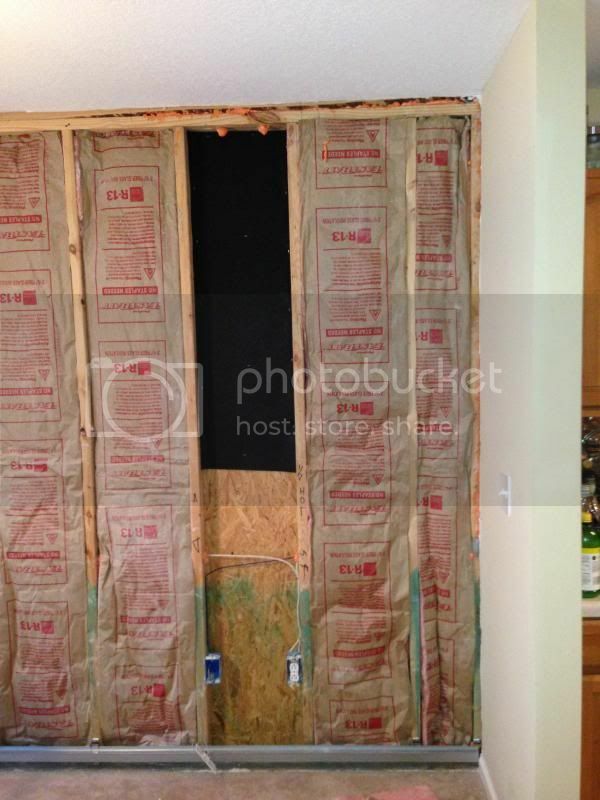 Example: party wall with 2 x 6 studs and one layer of 5/8", fire-rated drywall. The drywall is about 2.6 lbs per square foot. The distance to the next boundary (osb) is 5.5". The fundamental resonance of this wall panel will be about 37.5 Hz. So, at 37.5Hz, sound will pass right through this partition - AS THOUGH IT WERE INVISIBLE! That's why you can hear the thump, thump, thump of the neighbors stomping around or their home theater system bass - as clear as if it were right in your room. The resonant freq. of the osb (most likely around 7/16" thick), 1.62 lbs/ft2, will be 47.5Hz... so now you're up to 50Hz.. things are getting clearer. But you change YOUR side of the wall (with or without Green Glue) and the noise level will drop drastically. YOUR side will have a resonance of 26.5Hz. At 26.5Hz your wall will be effective at blocking sound down to 37.5 Hz - As long as you fill the wall with fiberglass building insulation. (the regular cheap stuff works best here, so don't go for any exotic absorption material). The calculation is; SQRT of 2 multiplied by the resonant frequency of the wall. In many cases in the past we have build triple and quadruple partitions in some high isolation builds, but this is not for the amateur as MAM calculations and precise building details must be followed for the 'system' to work properly. All of my builds today only incorporate double partitions as they have been proven superior. However, sometimes there is no other way than to 'deal' with a triple partition. - definitely NOT the end of the world if you apply a little engineering. The examples above are based on a cavity of only 5.5" and are 'for example' only. More information is available on my publications page. thank you for the information your website provides. ‘plan of attack’, thinking wise not to touch the plywood (security, probably not allowed by HMO, nil-effect of flanking noise, etc.) I attach drywall and Green Glue (GG) to the plywood of my side (similar to the process of attaching drywall and GG to the bottom side of subfloor), insulation, MLV, RC1, drywall, GG, drywall, texture/paint. the plan is to cover the four points; absorb, decouple, mass, dampen… not simply rely on one. if I were to ask a couple questions; what to avoid as not to worsen the 'Quadruple Leaf Effect'? and if I were to substitute 4’x8’ sheets of ¼” Cement Board for a layer of drywall (for the mass)? the existing floor consist of plywood subfloor on floor joists, ¾” pored Gypsum Concrete, pad & carpet... to which I will lift pad & carpet and put down two layers of ¼” Cement Board and GG, Rubber Underlayment, replace pad & carpet. Thank you again for your website’s info, and any ‘plan of attack’ critiques. Your party wall is 'what it is' and should not/can not be different. The Quadruple leaf is NOT necessarily a bad thing. But first we need to determine a standard level of isolation required ... Then we can proceed to invest our efforts & money. What level of isolation are you trying to attain? A single number (STC) is helpful but is only very general in nature. More specific would be the decibel level reduction required AT particular frequencies. If you can specify an STL (sound transmission loss) at the LOWEST frequency required, THEN I can recommend an approach. But be realistic and practical when specifying the amount of isolation at LF because it can become VERY expensive, very quickly. If we 'take care of' the lower spectrum, the higher frequencies will be more than good. professionals (like yourself) speak / understand the terminology. definitions, wall / floor construction diagrams, products, are a ‘click away’ in the library the Internet provides. presently what volume (decibels) are the noisy furnishings, fittings & dialog (frequencies) being observed (measured) in my space? I lack the experience / training. rent / purchase instruments to (analyze)? Yes. do my homework ending with solution? Yes. the ‘plan of attack’ consists of homework… cover the four points with an honest attempt and realize the nulling-effect by flanking noise. level of sound isolation I am trying to attain? peace and quiet please.